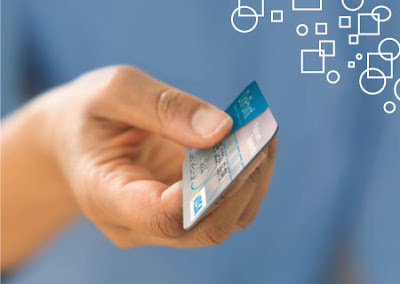 Do you have any credit cards with reward point options? If you don't believe you do, you may want to look into it anyway, you might be surprised at what you find! So, last week I happened to log into my online banking account to check my balances as I do regularly to ensure that everything was being paid on time. I happened to see an interesting bit of information on my account page. It was a message reminding everyone to redeem their rewards points before they expired. I started wondering if I in fact had some and hadn't realized it yet and wondered how I could earn them. I looked at the front of both my debit and credit card from my bank and they both had the word 'REWARDS' written one the front. How had I never thought about this until now? I made a quick call and discovered I had earned just under 12,000 points in the past few months. Without knowning what could be earned with those rewards I decided to sign in and create my account to see what I could get. It turns out there were a whole lot of great items and gift cards available. Without using up all of my points I was able to score $75 dollars worth of Target giftcards that arrived this morning! I am so excited. Just weeks before my discovery I had prayed that God would show me money in unexpected places (as money has been tight with the slowing of mine and hubby's businesses) and that He did! We are loved by such an awesome and powerful God! With Christmas in just 25 days, you would have a chance of redeeming your points and getting something you can use as a gift or giftcards that will translate into gifts for your family to help save you money this season! Another area that gets forgotten about is gift cards. I like to keep mine together in a little pouch in my wallet so I always have them on hand to use as cash, but I know many of you might have some in your wallet, some in a dresser drawer, etc. This is another wonderful way to use resources you already have to save yourself money on gift purchases this season. Don't forget about airmiles! If you are planning to visit family in the coming weeks, be sure to look into your airmiles balance to see if you can redeem them for a free flight. Click HERE to see how I discovered free money in my other bank account and you can too! Do you ever build something up in your head only to feel disappointed- or on the contrary- very relieved later on? We women can sure plan up a storm- in our minds that is! We often try to play out in our head how a particular event will go, who might show up and we play out scenarios of who we might bump into and how long we want to stay even before we get there. We might be dreading the thought of running errands with kids in tow and how the day will feel so much longer, anticipating whining, defiant behavior or tantrums only to find out that the day went without a hitch! As I mentioned in last week's post, I was scheduled to work on black friday. It's rare that I do this anymore but for some reason (possibly because it was all new to me) I had built the whole thing up into something I was dreading, all while I was still enjoying Thanksgiving dinner with my family! I was thinking about how long the day would be, and being new how customers might get frustrated with me as I'm still training, and many other thoughts went through my mind too (I've always been quite analytical, which is a curse really.) And you know what? NONE of them were founded! The evening wasn't overly busy, it was a steady stream of people. The company provided dinner for us, so even my dinner break felt longer and the store was a lot more quiet than I had anticipated. This was a huge reminder for me that as much as I want to be in control of the outcome, or be a planner and organize the day in my own thoughts, it never goes the way we plan anyway, sometimes it works out better! My dad once said to me, "If you don't have any expectations, then you can't be disappointed!". How true that advice is. A few times on my birthday as a child, I had envisioned something different than what was, and then feeling a bit disappointed later after all of my friends and family had gone home. What we believe to be true tends to take over and can really shape our day, but most importantly our ATTITUDE and our outlook on life. 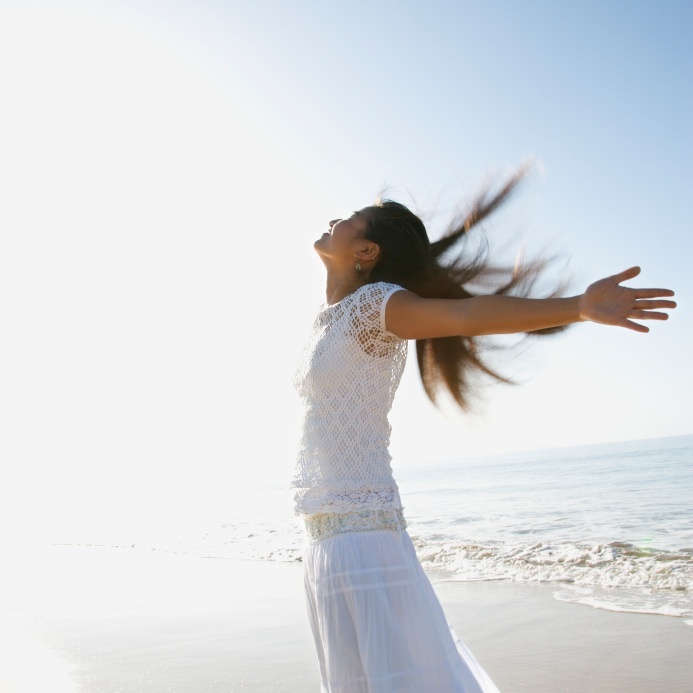 We have the ability to create great joy, anticipation and excitement for ourselves or anxiety, dread and stress. Our mind is a powerful tool, we need to use it to our advantage. Don't use it to defeat yourself before you've even begun the day with thoughts of insecurity, inadequacy, fear or judgement. Be still, be present and let the day unfold as it was intended, it is so much more freeing. I wanted to wish all of my dedicated readers' a very Happy Thankgiving to both you and your families. Be safe and enjoy lots of turkey and treats! I am thankful for many things including you! What percentage of people do you believe re-gift? You might be surprised to know that a recent study revealed that 67% of all people have re-gifted at some point in their life. Another interesting fact is that the most popular way to re-gift is to pass along the items to co-workers at Christmas time. About 40% do just that! At one point, re-gifting was considered to be a huge faux pas and done in poor taste. Today, however, it has become widely acceptable in our modern society. Blame it on the economy or the green movement, but people are determined to save their hard-earned money and keep items out of the landfills too. It's a nice way to make use of unwanted gifts that are perfect for someone else you may know that would appreciate or enjoy it more. Sometimes a return is impolite or just not possible and this is a suitable alternative. I do realize this option isn't for everyone and many are uncomfortable with the idea f re-gifting for various reasons. 1. Keep a Log Book- To avoid uncomfortable situations, if you tend to put items aside to give to others, be sure to keep a small log book to note who gave you what so you don't give the same gift back to the person who gifted it to you to begin with. That would be incredibly embarrassing. This also allows you to think of your circle of family and friends so you can ensure that nobody close to the gift recipient may recognize it. If you are not 100% sure of who gave you the gift, do not regift that particular item. 2. New Items Only-Under no circumstances should you ever give a gift that was used or opened. All items need to be new, in immaculate condition and in their original packaging also. You wouldn't want to receive a used present or a gift in banged up packaging, and neither will your recipient. Be sure to keep all 'regift' items in a special closet or bin and ensure everything is kept clean and free from dust also. If you are giving a book of any kind or jewelry, make absolutely sure it was never inscribed. That would be awkward for both you and the recipient. 3. Shop Mindfully-You should use the same selection process when shopping through your own gift closet as you would if you were in a store. Be sure that the gifts you choose for your recipient show thoughtfulness and are geared especially to their hobbies, interests or preferences. For example if your friend dislikes the color green and you give her a green scarf, that won't be well received. 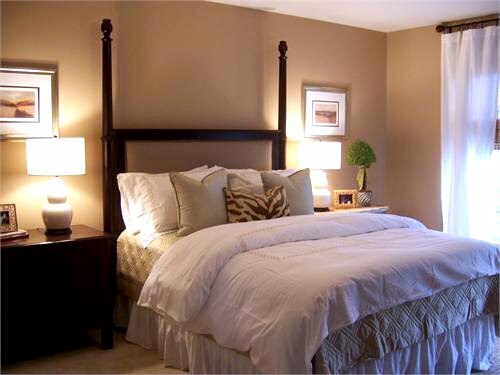 Don't give a gift for the sake of de-cluttering your guest bedroom closet. The gift must be useful for the person who will receive it. 4. Be Honest- If the recipient asks you point blank if it was a re-gift, don't lie. Let them know that it was hand selected for them because you knew they'd like it for "x" reasons. Know that 99.9% of the time nobody will ask you this question, as asking the very question is a bit rude and distasteful. 5. Make it Special- Wrap it up in some pretty paper or a gift bag also in pristine condition (it is never okay to give any gift-purchased or re-gifted in a crushed or used looking gift bag). Be sure to check the tags on the gift bag too to make sure it doesn't contain old names on the "to" and "from" areas. 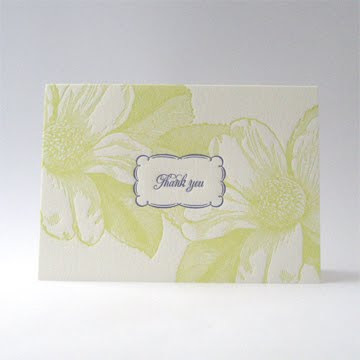 You'll want to write a card to go along with your gift where you can perhaps write a brief line or two about why you chose such a gift for your friend or family member. 6. 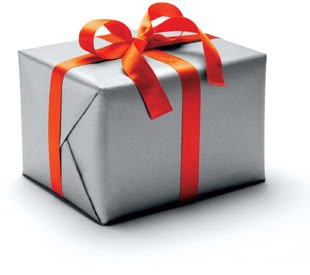 Inappropriate Gifts- You might have a closet full of re-gift items just waiting to be unloaded but you are far better off to show up empty handed and send an appropriate gift later then to just bring any old thing along for the sake of showing up with a gift. Put yourself in the recipient's shoes. How would you want to be treated? 7. Have Fun- Enjoy preparing such a gift as much as you would heading to the mall and shopping for hours. Be confident in your decision to re-gift and don't let other people's opinions on the subject make you feel bad. If you truly believe the gift comes from your heart and you are perhaps a little low on cash, do what makes you happy. Remember, the new modern manners and etiquette of today do not turn up their nose on this subject just so long as it is done tastefully and discreetly. 8. What NOT To Re-gift- You're probably wondering if there are any exceptions to the re-gifting rules. There are several types of items that you shouldn't re-gift. 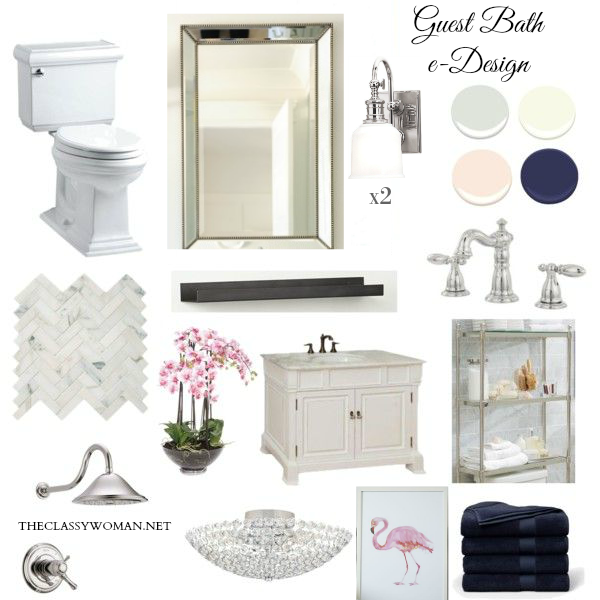 Many items have a shelf life such as lotions, perfumes, and other bath products. If they have turned color or the consistency has changed they are not only unsuitable for giving but they need to go into the trash.This is where using a log book comes in handy because you can add the received date for the gift. Likewise family heirlooms, expensive jewelry, travel souvenirs, items with corporate logos or any type of outdated or unusual DVD's, CD's or books. Never regift an item that someone has handmade and taken great care to give to you. While re-gifting is popular during the holiday season, you can also do the same for other occasions like birthdays or baby showers where you may have been given a duplicate item that never got opened or used. As long as you follow the guidelines above, your gift recipient should be just as thrilled to open your gift as they would one from someone else and you keep money in your pocket and find a home for a useful item that simply didn't work out for you. So you must be wondering by now if I re-gift, given that I've just dedicated a whole blog post to the subject. The truth is that I sometimes do. I don't go out of my way to make everyone's Christmas gifts re-gifts, obviously that would be ridiculous. I do however from time-to-time receive gifts from well meaning family, friends or acquaintances that just aren't my personal preference. They are items I'll never use that would otherwise sit on a shelf and eventually wind up in the trash (if it was perishible) or donated to a charitable organization. I do donate items when I don't feel they might be appropriate for anyone I know. The majority of the time I use my lower value re-gifts for white elephant exchanges where it is generally very acceptable and the whole point of the event is for fun, often the very enjoyment comes from gag type gifts or themed gifts. Now there are actual re-gifting parties where people bring their unwanted items to swap for something they will in fact like and use. Beyond the monetary aspect, in general I just believe people have too much stuff. There is a whole lot of excessive manufacturing taking place to produce new items which pollute our planet, which is completely unnecessary. What are your thoughts on re-gifting? Are there particular items you feel should never be passed along? With all of the grocery shopping, fall decorating and preparations before Thanksgiving Day, with just one week to go I thought it was only appropriate to focus on the most important part of this holiday- being thankful. It's so easy to get caught up in feeling as though you don't have enough, or won't have enough for the holiday season. The constant news updates on of the state of the economy alone could put anyone into a state of depression. However, it's important to dig deep and remember all that we have been given, all of the skills that we have to offer, our families and dearest friends, our freedom, and all of the things that we do not suffer from in terms of our health. Nature always connects me to what's most important. This morning I went for a 30 minute walk to stretch, take in some fresh air and start my day. I came across some beautiful monarch butterflies hovering over some wildflowers, fluttering about and I was reminded of the amazing power of transformation that we each have within ourselves. 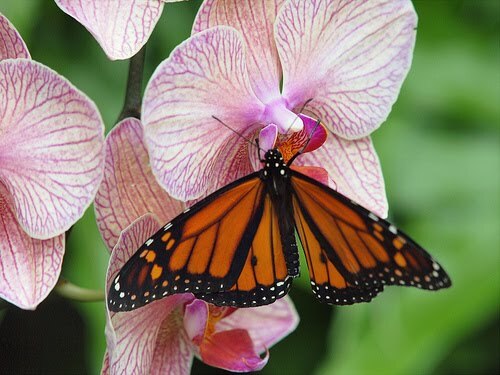 Butterflies are such beautiful creatures that always bring a smile to my face. I found myself stopping to just watch them in their natural environment without a care in the world, doing what butterflies do. Later on during my walk I saw some baby birds up high in a nest chirping and learning to fly. At the end of my driveway I'm lucky enough to have a very old and large oak tree that is home to mainy squirrels and birds, in particular -bluejays. Some days I only need to look out my window and see the little lizards scurrying about on our front porch and it brings me to a simple, peaceful place. 1. My Husband- I am also grateful for all of my family and friends but today I am most grateful for my hubby. No matter what life throws at us, we are a true team who celebrate when the day calls for it and love and support each other through life's toughest challenges. This year there have been several and it makes me realize how loving and committed he is to our marriage. 2. My Home-There have been some highs and lows with my hubby and I both being entrepreneurs and running our own businesses. It has required a LOT of faith some months, but we are always provided for and we always have a roof over our head. 3. My Car- it always starts when I turn the key in the ignition, it has never left me stranded and it's comfortable and clean to boot! 4.. Free Veggies- My husband was visiting some friends the other day and they happened to provide him with a bag of veggies and fruit from their garden as they had many extras, which was a wonderful blessing. 5. My Health-Perhaps one of the greatest gifts, I am most grateful for my health. I am happy to have so many natural options around me and access to wonderful supplements and nutritious foods as well as medical care when needed. Not all countries have the unlimited options and supplies that we have. 6. Gorgeous Weather- This is the time of year that Floridians long for. The warm, breezy days filled with sunshine mixed with the cool, crisp evening walks. I have always loved autumn in any place I've lived but am perhaps most grateful and thankful for it in FL after a very long, hot, sticky summer. 7. God- My continual source of strength, faith, hope, love, joy, peace, mercy, grace, contentment, provision and finances. Of my list today, I am most thankful for my relationship with God, the one who never lets me down. In my books He is above all things. What are you most thankful for TODAY? Share it with us! Do you get up before the crack of dawn and brave the mayhem with a list in one hand and a cup of coffee in the other? Do you peruse the web in search of rock-bottom prices and send out family members accordingly, or do you simply say 'no' to post-Turkey activities and get some much needed zzzzz's? Yes, we're talking about black friday. My hubby and I have participated every year in what I refer to as freaky friday. Since I've only lived in the U.S. now for 3 years it was something new to me. In Canada, Thanksgiving is celebrated in October (on Columbus day), so this crazy post-Thanksgiving event doesn't even exist. However, here's a bit of trivia-Boxing Day (Dec.26th) is the biggest shopping day in Canada. For all of those people whose gift was money in a card-that is the day they wait for! I do like the idea of getting great deals before Christmas day, but to date the only real deal I got was 2 years ago, it was a Cricut machine and I was the first person in line at Michael's which my hubby thought was nuts. He came along and waited with me in the car for safety reasons since it was dark and the parking lot was empty. It was actually a present from him to me as it was on the top of my list. One year we headed to BestBuy for a digital camera that had been gone long before we even made it inside the building. Another year we bought a bike from Walmart and as soon as I tested it in their parking lot, squeeky brakes and all, I realized it wasn't the right bike for me. So- nothing overly fruitful. This year will be a little different and a first for me, I will be working amidst the craziness at Target. (I picked up some seasonal hours for fun and of course a little cash that I can put into my savings account. )Thank God I'm not starting at 4:30am like many of my fellow colleagues! With the state of the economy, I believe this year will have a lot of doorbusters as companies try to capitalize on the day. Ads are also circulating earlier this year. 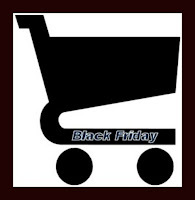 For all of you who DO have shopping on the horizon click HERE and HERE for 2 great websites dedicated specfically to this event. They have alphabetized lists which provide the black friday ad for each store (once it's available)-many are up already! 3. Bring a friend for safety reasons and so you can help each other with your lists, besides it's no fun to shop alone. 4. Leave your Kids at Home. They may get trampled, you may be shopping for them and besides they'll be exhausted after about an hour. 5. Stay within your Budget. No matter how good a deal is, it's not worth getting in to debt over. What starts as $100 could turn into thousands after months of accumulated interest. For those of you that didn't know, many stores allow you to shop online the day of, so no need to get dressed and head into the crowds, you can buy what you like from the comfort of your own home. What is the best deal you've scored on Black Friday? I love to hear about deals and money savings, so leave us a comment! Have you ever had family or friends stay with you that were so irritating you wished you could just tell them how you felt or wished they would go home? Perhaps you were that house guest at some point without even realizing it. Staying in another person's home is not always the most comfortable or enjoyable experience at times, even if you're staying with those that you know well. If you're new to staying in another person's home you might be left wondering what your role is. In last week's post, we looked at etiquette for hosting house guests, just in time for the holiday season. Below are some tips on how to be the kind of house guest that your host will truly be sad to see go. 1. Write a List- While a friend or family member probably wouldn't mind sharing a hair dryer with you or letting you borrow their tube of toothpaste, this could become annoying over the course of a week to share various items. The best bet is to make a list several days before you pack your bag(s) adding new items as you remember them and cross off each item as you put it into your bags. This way you'll avoid having to run to a local store to pick up toiletries or constantly asking your friend to use their floss, etc. For larger items like hairdryers, if you'd don't have a tiny travel version you might want to ask our host about that beforehand. They may have an extra or tell you not to worry. 2. Be Thoughtul- Just as I shared in the hosts' etiquette tips, you might want to do something special or thoughtful to let your host know you appreciate them having you in their home. It may be a bottle of wine, a thoughtful card or handmade gift or it may be a dinner out on the town, add that to your list and do forget to bring that item along if it needs to be packed. While hosts don't generally expect anything in return, they do go to a lot of effort cleaning and preparing their home and a room for their guests and it's nice to feel appreciated. One area to be mindful of is when booking your flight/train ride or arrival that you try as best as you can to make it during the hours of 8am-10pm. Arriving at midnight, especially during a weeknight can be exhausting if your host has to pick you up. 3. Don't Do Anything You Wouldn't Do in Your Home- This probably sounds obvious but say for example you need to take off your mascara and you're provided with a lovely white washcloth. You probably wouldn't use that in your own home for fear of staining the cloth. Ask you friend for a darker cloth or be sure to wash it off really well before using the white towels. One exception is putting your feet up in someone's home, especially on a coffee table is a no-no. No matter if you do it in your home or not, it's not respectful. Be sure to ask your host about wearing shoes in the house and what their policy is. Don't smoke on their property without asking where it is acceptable to do so. 4. Clean Up- Regardless of how neat you like to keep your home, it is important and will show respect if you make it a habit to tidy up after yourself whether it be making your bed in the morning, hanging your towel up after a shower and putting away your toiletries or putting away item used in the kitchen. The last thing you want to do is make extra, unnecessary work for your host. in fact, if you have a little time your host would be overjoyed if you did the few dished in the sink, loaded the dishwasher or tidied up the shoe area in the front hall. Anything you can do to show you care and can make their life easier will mean more to them then you know. If you happen to break, spill or ruin something, make sure you get to it right away and let your host know. It's never a good idea to try to cover up something that's been damaged. 5. Do it for Yourself- If there is anything that you can do for yourself such as make you own breakfast, make coffee for everyone in the morning or do your own laundry, do it. You don't want to overwhelm your host with trivialities. If your host has not given you free reign and declared 'mi casa es su casa' then ask politely if you can make coffee for everyone vs. taking initiative. If your host hasn't told you to make yourself comfortable and grab what you need, they may have forgotten or may have a preference for who does what in their home. If you see them preparing dinner though, jump in and help them. If you ask them if they need help, they'll likely say "no". 6. Keep Comments to Yourself- You may be staying with a couple, your parents or complete strangers. Whatever the situation, it's always a good idea to try to mind your own business. If there is a marital tiff or a couple asks you for your opinion in a joking way, let them know you don't want to get into the middle. If you disagree with the way your sister parents her children, or perhaps there is a funky smell coming from the fridge or you don't like what is being served for dinner, do not comment. Just remember that while you may do things differently, you're only a guest for a few days and then you can home and do things as you wish. 7. Departure- While wine is a gift best given the first day of your trip upon arrival, a card along with something you've brought from home or a beautiful bouquet of flowers you picked up locally would be a wonderful way to thank your host and give them something goregous to remember your visit by. If your host played 'tour guide' to you in their home town, or you spent your days sightseeing together, you might even want to put together a cute and inexpensive little photo book and mail it to them afterwards. You can always email them your best digital photos, just be sure to include some of you together. If you were having so much fun that you forgot to even leave a card, be sure to mail one out as soon as you get back home. Click HERE for some great hostess gift ideas for a dinner party or your next in-home stay so you can be a grateful guest. Have your house guest experiences been good? What things did your guests do to either really suprise you, annoy you or elate you? Leave a comment! In the sprit of the upcoming Thanksgiving holiday, I wanted to continue my theme of giving by offering you all a fabulous freebie, something that everyone can use this Thanksgiving. 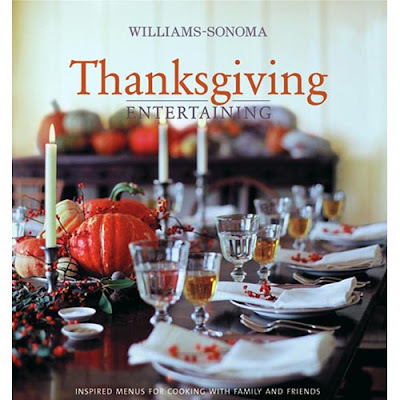 HERE is a link to a copy of Martha's downloadable Thanksgiving cookbook! It's a PDF, so be sure to save it to your computer. I don't know about you, but ALL of these recipes look amazing! I'm not sure which one to make first! One things is for sure though, I will be trying out a few of these soon! Part of my New Year's resolution for this year was to experiment with more recipes. I'm sure hubby will be happy! Which recipe do you think you'll try first? Let us know! BTW-If you haven't already filled out our first blog contest (our other freebie) click HERE to enter! Contest ends today at 6pm EST. Hello Ladies! I'm excited to do something a little different from now until the end of 2009. I am running a little contest (actually, it's our first one here at Classy and Fabulous) to advertise your business for FREE! Why you ask? Because you are my valued blog readers and I want to bless you. I also believe in supporting other women and enjoy watching their success! Advertising can be one of the most expensive costs for a traditional business and I don't know any blogger that doesn't want more exposure for their blog. If you have a blog, blog website, an Etsy Business or a traditional business website that you want to promote and will appeal to the readers of this blog, I will be selecting 3 different readers to showcase on my blog from Monday, November.16th until the end of this year, giving each winner the same amount of advertising time. 1. Be (or become) a follower of this blog. 2. Leave a comment at the end of this post with an optional link to your page (so this is actually FREE advertising for everyone entering the contest) and tell me how long you've had your blog website/business for and why you are so passionate about what you do. That's it! I will be selecting the 3 winners on Monday evening at 6pm EST by means of a random hat drawing and will be contacting each of you so that I can get your logo, blog button or a special image that I will feature in our sidebar along with a link to your site. If you want to link back to my blogpage, that is optional but always most appreciated! If you don't have a business but feel that someone you know would enjoy this blog and may want to enter this contest, feel free to forward this page link to a friend. Look for the little envelope icon under this post to forward it or you can forward this post via twitter or facebook by clicking on the icon in our left side panel. I'm looking forward to featuring you~Good Luck! My husband and I just solidified our plans for Thanksgiving. We're heading to my inlaws home where there will be about 12 people. My mother-in-law loves to entertain and cook so it only seemed fitting that she would be hosting yet another holiday gathering. In fact, she hosts almost every year, but really enjoys showing off her skills and she is a natural. I typically bring a special homemade pie, usually pumpkin, and some other appetizers or treats for everyone. Once we have children or we move into a larger more open concept home, I can almost guarantee that I'll be hosting at some point, but in the meantime I'm enjoying not having a mess in my kitchen and lists full of things to prepare. I love to decorate and host small dinner parties but my husband and I aren't the kind of couple that enjoy having more than about 8 people (including ourselves) for a dinner or hosting large parties in our home. I guess you could say we are a bit more private when it comes to our homestead and we enjoy more intimate gatherings. We have a smaller kitchen that is not very open which can be frustrating because all of the fun and conversation is behind my kitchen wall (in the living room) and after preparing several courses I feel like I've missed out on the whole point, which is to catch up with family and friends. Because of this, I usually try to do most of my prep work beforehand to make dinner gatherings as seamless as possible and my crockpot is one of my favorite tools in the kitchen. The first year we were married our oven broke down right before family arrived for the holidays and I wound up making an entire Christmas dinner for five with my handy crockpot and it turned out great! With this wonderful holiday being just 2 weeks away, I got to wondering what you all had planned for Thanksgiving day. Do you host a dinner in your home? Are you like me and bring goodies to a family's home or do you alternate year after year taking turns with other family members? What are your favorite dishes to bring or cook? 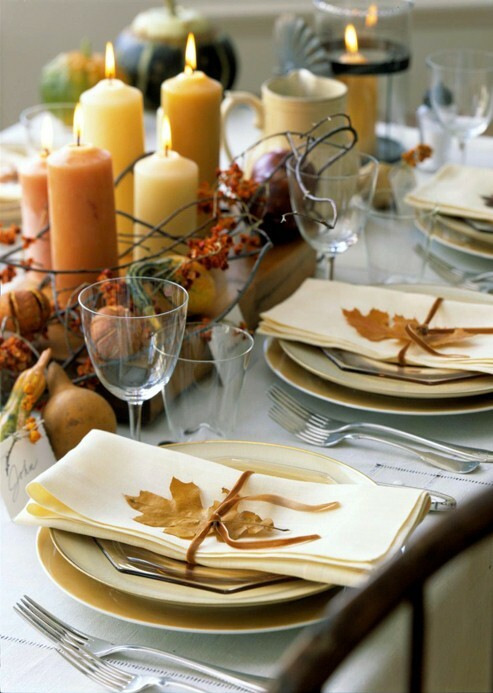 If you're hosting this year and you want some great Thanksgiving or Fall decorating ideas, click HERE for some beautiful indoor and tablescape ideas and HERE for some gorgeous outdoor decor. If you want to bake something other than the traditional pumpkin pie for dessert, take a peek at this heavenly caramel apple pie recipe that will leave everyone wanting more! Do you struggle to find your cell phone in your handbag when it rings? Do you have a hard time finding important items when you need them the most? It may be time to do a little de-cluttering. Here is a concise little guide to keep your most important stuff within reach and will save you precious time. 2. Sort in 4 piles: garbage, relocation, keep in purse, to be filed. Start with obvious trash items like candy wrappers, tissues, old business cards and papers. Take it straight to the garbage when you are done cleaning out your bag. Once all trash is cleared out, move onto to what you know you will keep in your purse. 3. Items to Keep: These should include keys, wallet, sunglasses in case, cell phone, one quality working pen, one package of gum (or mints) , dental floss and/or a toothbrush with small tube of toothpaste. You might also require a small tissue packet and a lip balm/gloss or lipstick/lip gloss and one hair clip or tie. If you plan to keep makeup in your bag, place it in a small portable makeup bag or a ziploc bag so you don't have to rifle through your whole bag for it. You may also want either a brush or a comb and a small tube of hand cream as well as a tiny lint roller. In a smaller zipped side pocket you might keep a small pack of medication or feminine hygiene products. Items to reallocate would be things like kids toys, extra pens, pads of paper, CD's, extra hair clips, combs, brushes, travel size hairspray. 4. File any receipts, documents, appointment cards etc. right away as to avoid losing them altogether. 5. Open up your wallet and remove any expired coupons, old receipts, papers, and toss them, leaving only your own country's currency, a couple of your own business cards, and your checkbook if applicable. 6. Find any appointment cards business cards that need to be filed and do so now. Find a home for foreign coins and bills. 7. Keep all relevant cards, stamps, and credit cards, eliminiating all rewards points cards that you rarely use. Instead take these with you only when you know you'll be heading to that particular store. Make photocopies of all important credit cards and documentation and put it in a safe place, in case you lose something. Keep your purse and wallet organized by weekly going through it and removing receipts, trash, papers and cards that don't belong. I recommend doing this on Sunday night to start the new week afresh. See if you can make your purse lighter by trading change out for bills at the bank or local coin changer. Store all baby and kids items in a separate diaper bag or knapsack as to not turn your handbag into a dumping ground. I wrote this article a couple years ago and it was inspired by a friend that could never seem to find what she needed in her bag; particularly while in checkout lines, which seemed to be frustrating for her and everyone else behind her in line. I hope it will help you stay organized! Do you make it a habit to organize your handbag and wallet? Do you have other organizing habits that you keep up with to make your life easier? Share them with us! I came across this quote the other day and how true it is! 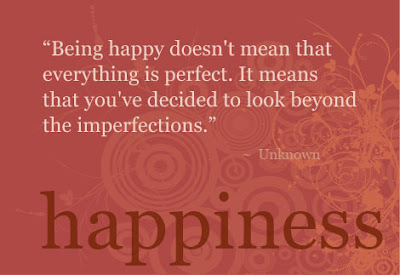 Many people often look for happiness in things, people, their children or an event. The truth is that we cannot be happy until we make the decision to be just that. It's easy to get wrapped up into thinking, "I'll be happy when __________" fill in the blank, and miss the moment that we're currently in. It's okay not to be perfect or have everything figured out, because the truth is that nobody else does either. Try to quiet your mind today, be still and breathe in the present moment. Can you hear the birds chirping? Do you delight in the little squirrel on your front yard stuffing it's little face with nuts? Beauty is all around us if we simply choose to focus on it. I spent last week in the San Francisco bay area visiting my father and everyday I was overjoyed to take in all that I could whether it be a drive along the coast to inhale the ocean air, watch the sea lions flop around by the Pier in Santa Cruz or take in the beautiful redwood trees in Palo Alto. Today I'm happy to spend the day with a dear friend who is visiting from out of town. While we have some loose plans in place so that she can make the most of her 3 day visit, we're both open to what the day has for us. We look forward to delighting in each other's company and having some girly fun. If you are in a frustrating, winter season of your life and are looking for inspiration I encourage you to read this post. I hope you'll make your day a happy one, no matter what it holds for you! As some of you know, I'm a writer and I have several published articles on the web. I thought this one in particular was appropriate as Thanksgiving draws near and the holidays are quickly approaching. I try to keep my cleaning tasks as manageable as possible by chipping away at them little by little instead of having them pile up on me, which then requires a huge spring cleaning. Here is a guide that I put together so you can stay on top of your largest appliance-the fridge. 1. Wipe Down- Use a sponge or light, soft scrubbing pad and soak with soap and water or a kitchen cleaner to wipe down the exterior of the fridge. If you have lots of papers and magnets on the fridge, take those off first. Consider only keeping 3 magnets on the side or front of the fridge as this tends to instantly make a kitchen look cluttered. Remove all sticky marks, fingerprints and don't forget to wipe the top of the fridge for dust if you have access to the top. 3. Clean on the inside. This is the most important part of the process. Now that the fridge is free from food items and containers you can take each glass shelf out and clean with kitchen spray or soap and water followed by a wipe down with glass cleaner. Make sure the inside corners and walls of the fridge are also wiped down. In the door of the fridge you'll clean each storage compartment then move to the fruit and veggie crispers etc. Take a good look and make sure that everything is sparkling. Wipe down all the bottles and containers with soapy water, dry and replace into the fridge. 4. Keep Odor under Control- Place a new opened box of baking soda at the back of the top shelf of the fridge. This will help keep odor in check as the baking soda absorbs bad smells. Always take a permanent marker and write the date on the box. Remember to change it every 3 months. In addition always place items in the fridge in either a plastic sealed bag or plastic container. If you leave an onion half-cut in the crisper, you fridge will smell like an onion and your milk and juices will taste like it. Smells travel so keep them at bay. Also add a baking soda box to the freezer and follow the same premise. 5. Keep Leftovers in the Clear. There is nothing worse than opening leftovers from a month ago and having to smell and see what is inside. Know what is inside of every container by investing in some inexpensive clear storage containers. You might want to use some clear labels to list the date and the contents. Leftovers will get buried in opaque containers. You are also more likely to see the item and eat it instead of wasting it as it winds up in the trash. 6. Everything in its Place- Set up your fridge so that like items are located in the same place. For example all condiments can live in the fridge door on one or two shelves All large containers of juice, milk and water are best on the top shelf of the fridge. Raw meat belongs on the bottom shelf as not to cross-contaminate should it leak. Each shelf can have a theme almost. Shelf two could be grain products like muffins, bagels, bread and maybe the associated spreads like peanut butter or butter. Use the fruit and vegetable crispers separately for what they are intended. This makes for faster cooking and preparation when you don't have to search the whole fridge for one item. 7. Stay on top of it! It is easy to see a gooey jam spill in the fridge and say "I'll get it later". Later usually becomes never and then everything else becomes sticky too. You'll do yourself a huge favor by selecting a day, maybe the same day you clean the rest of your home or a grocery shopping day, to keep it clean. When you look into your fridge weekly you'll only need to wipe it down, glass clean a few shelves, wipe down a couple containers and toss an item or two that has expired. The Fridge can seem like a whale of a job but only if you let it get that far. Tackle this big job once today and the payoff will be well worth it as you will spend minimal time with its upkeep. Not only is it presentable to your family members and house guests, it is a way to keep your home more hygienic and your family free from unexpected food-related illnesses. 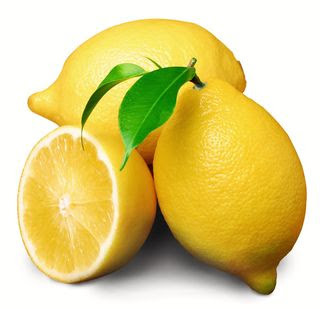 For another great home cleaning post using natural ingredients click HERE. For some quick tips on how to keep a clean car click HERE. Out of interest, who does the cleaning in your home-yourself, your spouse, roomate or are the duties shared? When I created the readers' poll in September, I wanted to get your feedback so I could tailor the posts for you, the reader. We've only had 6 responses so far but the most requested topic by far for future posts is Manners and Etiquette. If you haven't voted yet, please do! You can find it about halfway down the page on the left hand side. These past few weeks have been busy and I've been doing some traveling out of state which will be followed by a visit from one of my girlfriends later this week. I've been able to keep this blog updated by using the scheduling feature. If you haven't tried it, it really is a helpful tool when on vacation or during busy holiday times too. When you post, instead of selecting automatic posts, choose a scheduled date and time under 'Post Options' and the scheduler will do the rest after you hit the 'publish post' button. Once I'm back on my regular schedule you'll see many new posts on various topics but I will be sure to make etiquette of particular focus. Do you have questions about manners and etiquette? Did you find yourself in a particular scenario where you were unsure what the proper etiquette was or do you have a general question pertaining to this topic? Leave a comment and I'll write you back in the comments section where others can feel free to leave their personal experiences or advice should they so choose. I want this blog to be interactive so that you can get the most out of it. Should your question be of a private nature, you can email me by clicking on the envelope in the left margin. A month ago I was typing on my laptop and had QVC on in the background as Harley Pasternak was on, a well-known celebrity Personal Trainer. After many years of focusing on those in Hollywood, Harley has finally put together a meal plan book and a workout program for the rest of the world. How exciting! He is a wealth of knowledge and I was really happy to see a quick snack that he was preparing on the show. Mix the first two ingredients in a bowl. You could use a food processor, however you can just as easily whip it up in the bowl with a fork or spoon. Slice up the apple into several slices and dip away! Peanut butter offers a bit of protein on its own, however plain Greek yogurt is strained ( there is less water ) so it has a thicker consistency and offers much more protein than regular plain yogurt alone. The protein and fat help slow the breakdown of the sugar in the apple which slows the insulin response. Besides all of that it just tastes good and keeps you full too! 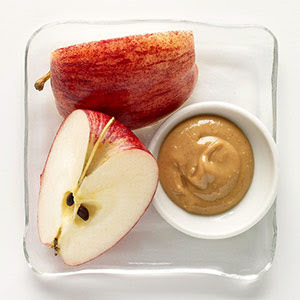 In our home we like to use granny smith apples because they are more tart in flavor and Smucker's all natural creamy peanut butter with honey. It provides a little sweetness but I'm trying to migrate us over to their natural peanut butter without honey, since we don't need the extra sugar. It has now become one of my favorite regular snacks. In keeping with the theme of health and nutrition, if you are looking to up your water intake, read this post. What are your favorite low-fat snack ideas? Do you have one that you like to make every day or do you get bored and need to mix it up with a new one each day? Leave a comment and share your favorite healthy snack suggestions so we can all try something different! Last week was a crazy week for me. I had the opportunity to spend some one-on-one time with some friends and family members that I hadn't seen in a while. Sometimes the daily aspects of life seem to take over and it's so easy to put off visits and catch up sessions until you've realized a few months have passed. I was able to spend a wonderful day with my husband's Aunt window shopping and having lunch. We were able to catch up and reconnect which was much needed for both of us. Later that week my mother-in-law had some free passes to Epcot so I was blessed to be able to join her for the day and experience the International Food & Wine Show as well. It was a day well spent. The day before heading to Epcot, I learned that a previously close friend was in town for vacation, staying with family, and asked if I was able to meet up with her. I was able to set aside one day where I could drive out and meet her. I should preface this by saying it had been over 3 years since I last saw her. Actually, the last time I saw her was at our wedding. She leads a very busy lifestyle and has an equally demanding career. I had made some attempts to contact her but hadn't ever heard back. From time to time I had wondered if there would be a chance for us to reconnect once I was back in my hometown. I had even started to wonder if perhaps she was upset or diappointed with me for one reason or another. Given the fact that everything was fine before seeing her at the wedding, the only thing I could come up with was perhaps she hadn't received the thank you card for her wedding gift that I had mailed her. But knowing her, I knew that wasn't her style, so I let that thought go. We were able to catch up starting from my wedding date up until the current day and I got to learn all about what has been going on in her life and she mine. It was a really great day and after an hour or so it felt like old times. I had even jokingly mentioned that because we hadn't chatted in so long that I wondered if perhaps it was due to something like her being upset with me, or perhaps not receiving the thank you card? I sort of laughed it off knowing that she probably thought I was being silly. Suprisingly, she said, "actually you know, I never did receive a thank you card." I was shocked and somewhat disturbed by the fact that I believed all this time that she had in fact received it. It was important to me for everyone's gifts to have felt appreciated and I love to send thank you cards. It made me wonder who else didn't receive theirs, since I had sent out every single one exactly one month after our wedding day and all at once. Our conversation was a bit akward after that for a few minutes and later on in the evening she had jokingly brought it up again, so I wasn't convinced that she believed that I had actually sent the card. 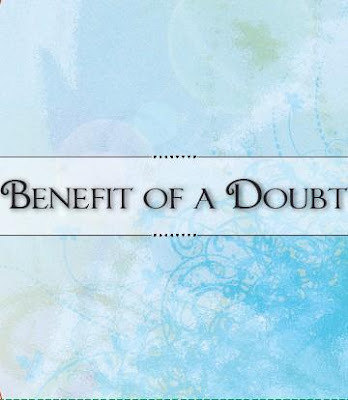 It made me wonder how often certain events take place in our lives and how quick we might be to assume instead of give the benefit of the doubt instead. It's so easy to let your imagination run away with you, instead of believing the best about someone. I once heard somebody say that we judge ourselves by our intentions and others by their actions. I know there have been times where I have tried to figure out why something worked out the way it did, or assumed instead of giving someone the benefit of the doubt. It will be my goal going forward to believe the best about everyone, especially the people who have disappointed me time and time again and whose stories don't always line up. It is not my job to figure everyone out or judge anyone's motives but rather to love others unconditionally and treat them as I would want to be treated.